Wow, scary and cool at the same time. Then I found a guy i bought gloves off before so I walked up and saw a pile in the back of his truck, looking thru I found a 20's -30's Basemitt and a D&M 1" web with a rough liner. The sewn web which was the glove I wanted more was going to wipe me out. Im less than halfway thru the market. So I politely declined and told him if I didn't find anything else I would be back. Walked the rest of the show with my 5 year old son and really didn't see anything better. So i went back and luckily the glove and mitt were still there. Both had issues but complete enough. So the D&M was pretty rough (see pics) and i knew the glove was some sort of buckskin. The leather was extremely dry and crusty so I went with JD"S trick of cleaning with a bowl of water. I really had nothing to lose so I cleaned the entire glove and saved the palm for last. First stamping I saw was a G4? then I started to see a cursive B. Then I'm not joking I see the model G41 and the name Babe in cursive. You got to be freaking kidding me!! Sent a pic to a couple buddies and they were seeing what I was seeing. I still can't believe it. Holy crap! They're still out there. Nice find Richie! Beautiful job cleaning it up. Thanks for the compliments Greg. By far the coolest glove I've ever found. I think I'm a lot more excited then everyone else! I have a very small collection including 14 Rawlings gloves, far more than any other brand. A lot have come and gone but I guess Rawlings would have to be my favorite brand. Here's some I got around to photographing. 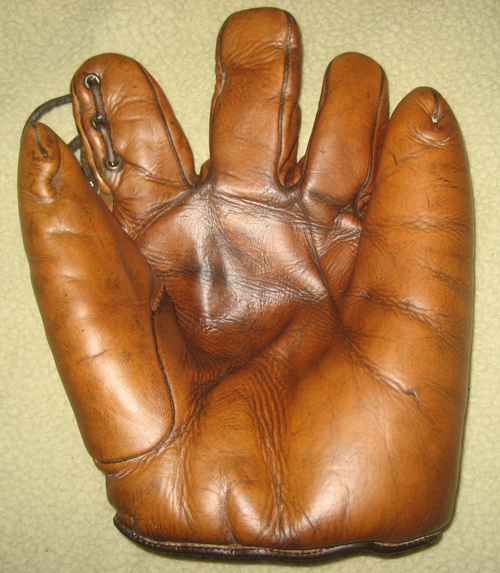 A 1920's Rawlings "The Gibson Mitt" model with a snap button pad adjustment. It's a rare one. A Wartime "Martin Marion" model MM. I had been looking for a nice one for a few years. The black leather piping has faded to a grey color. I liked that! 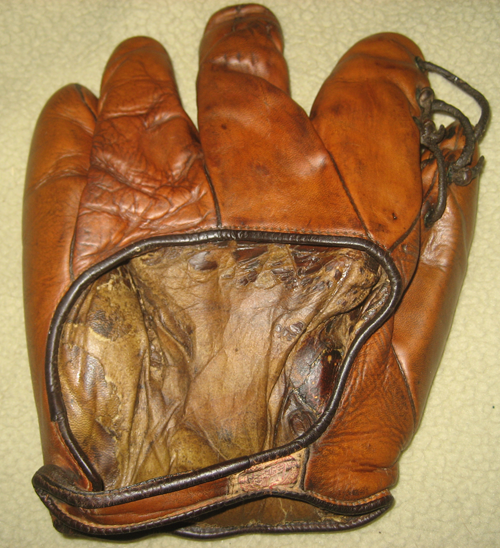 A 1920's Model 2BLX base mitt. I couldn't pass up the striking two tone leather with white leather piping. So cool! The Gibson and black Marion are on my list to own someday. The 2BLX is a stunner too. All beautiful examples. Love the black gloves that Rawlings made. I wish they would've made a black Playmaker. It would have looked so cool with a silver Stan Musial endorsement. I've had this Rawlings for awhile and it's still a mystery to me. All the stampings are worn off. I don't know if it's one of the Bill Doak variations or possibly a Bill Kamm. Not sure if I've seen an original Doak with three eyelets on its forefinger. They usually come with two, no? 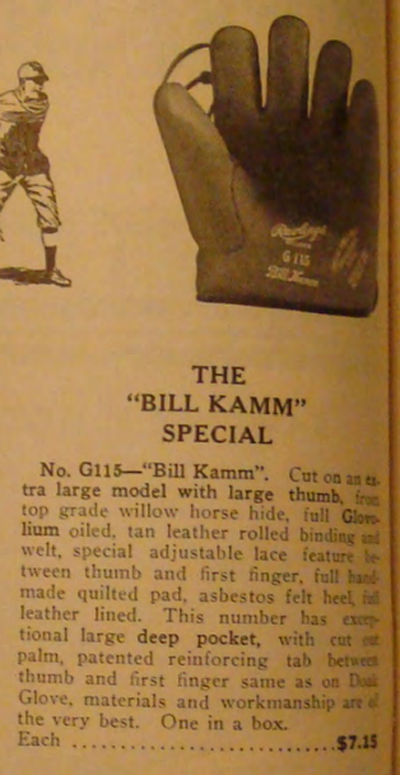 I don't see the eyelets through the fingers on the Kamm model. I think it is post 1922 based on the patent stamps at the heel. It is very similar to this WH5 model below. 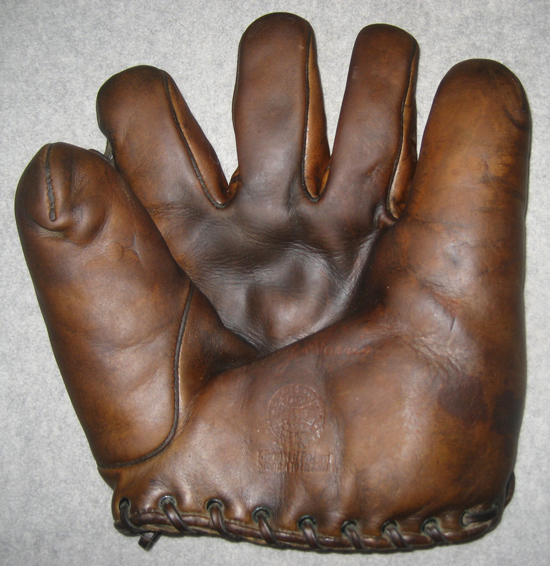 As a side note, the WH5 model number was used by Rawlings when the glove was sold through Witte Hardware of St. Louis. 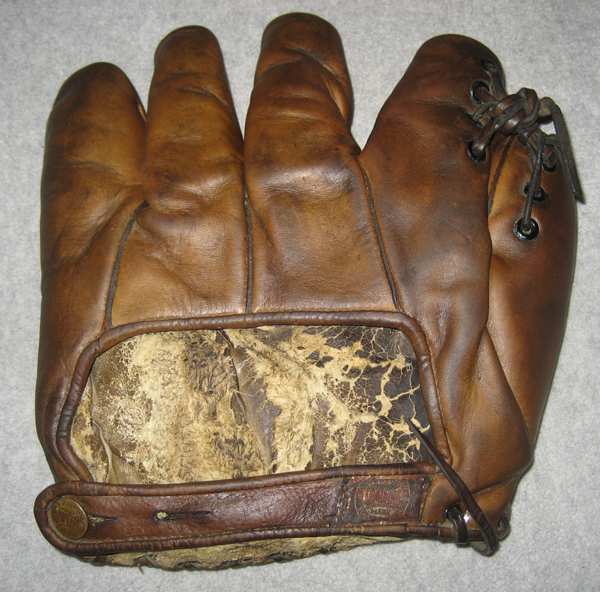 Below is your glove from a 1920 Rawlings catalog. Remember the Doak patent was 1922, so yours is one of the early pre-patent versions. Do you have any idea how rare that glove is, signature or not? Maybe numero uno and worth thousands! I was wondering when one of those was going to surface. I'm sure if you sent the photos to JD it would be the first glove posted in the "Bill Doak" section of the Glove Gallery. I read an article or maybe it was the patent document about the intricate lacing. The overlapping lacing through the eyelets provided friction so the ball player could fine tune the lacing length and tension and it would stay put. It really was a well thought out design. No wonder it was state of the art in its day. Last edited by mikesglove on December 26th, 2017, 6:25 pm, edited 1 time in total. Thanks for that information, Mike! I didn't know they made a Bill Doak prior to 1922. Never occurred to me to look through the earlier catalogs on JD's site. I thought that it might be a later variation on the original Bill Doak, but I couldn't find any matches in JD's Doak gallery. And it doesn't have the Doak tag. One thing I always liked about it are the long fingers. The couple of original Doaks I've had were stubbier. I can tell that my next obsession will be to find a photo of a player wearing one. How hard could that be? Thanks Brett!! the top picture of the three gloves, took a while for me to pull off. the glove on the left is a top line rolled piping Winchester. I need to patch the hole in the lining with a donor, just ain't done it yet. the finger holes and thumb are fine, the White D&M was a gift years ago from one of our famous members here on the forum, and a dear keepsake. and on the right is a Horace partridge sewn web....why are they in this order??? well the hunter is carrying his trusty Winchester shotgun and getting ready to shoot the pheasant that Nick the D&M dog is pointing!!! The second picture is of my newest addition by default...I was trading baseball cards to complete my 56 and 65 sets and the card dealer guy said you like this glove?? it is a D&M 651 with the "scar?" lacing down the back of the thumb. why is it beside my Lou Gehrig Higgins glove, endorsed by Babe Dahlgren...he replaced lou after 2130. Another Rawlings: A 1940's Lonny Frey model RV. A little different than the regular model LF. I've had a couple others in this style. Hope you find a donor liner for your Winchester, Don. Really good looking glove, otherwise. I've replaced a few liners and every time I've finished, I tell myself "Never again!" Then I find another one I really like with a torn liner. Your Lonny Frey is a beauty, Mike, and a tough model to find, I'll bet. I think it's the first one I've seen. The button strap instead of a buckle is really unique. I'm still downsizing, but managed to pick up a few last year. 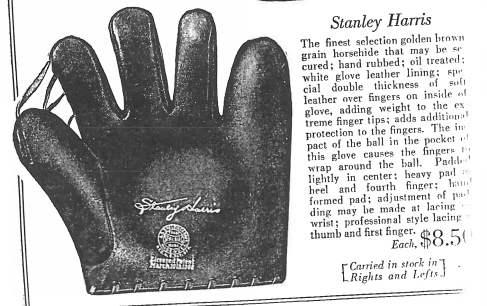 This Spalding Stanley Harris is my favorite and was one of their top line gloves. As usual, the tag was covered with grime. I cleaned it as much as I dared. I am just going to glue a piece of 1920s beater liner underneath the hole in the palm of the Winchester glove, and blend it with lard and tobacco juice, never tell it!!??? A rolled piping Winchester glove is hard to come by, and with their best patch!!! I held out as I did not want a Winchester without rolled piping, just because it said Winchester. The finger stalls are all fine. That is a great Lonnie Frey Gove!! Pepper Martin PM era!!! And there is a dandy MM Merrill May on eBay!!! Same era, correct patch for my unicorn, the PM Martin. A part of me wants to buy one of these and make me an East Tennessee modified PM with my wood burner!! !